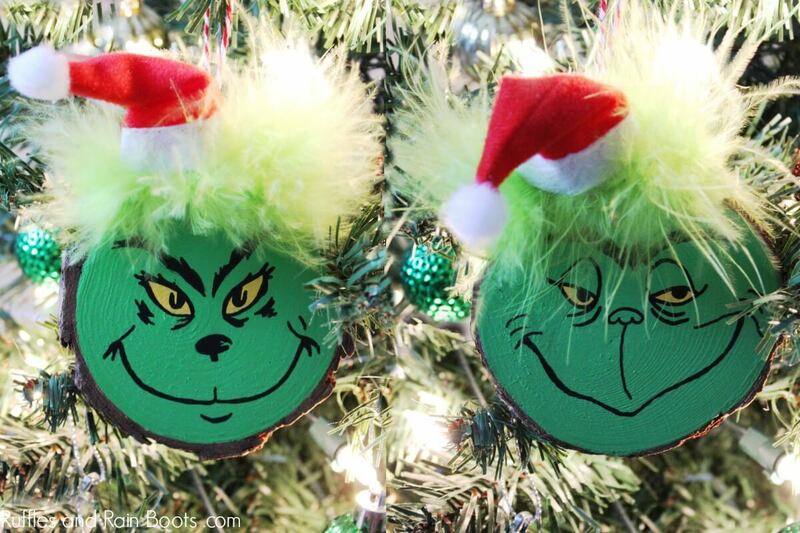 This fun DIY Grinch ornament set can be made by young and old. Get into the spirit of the season by making this simple Christmas ornament set. 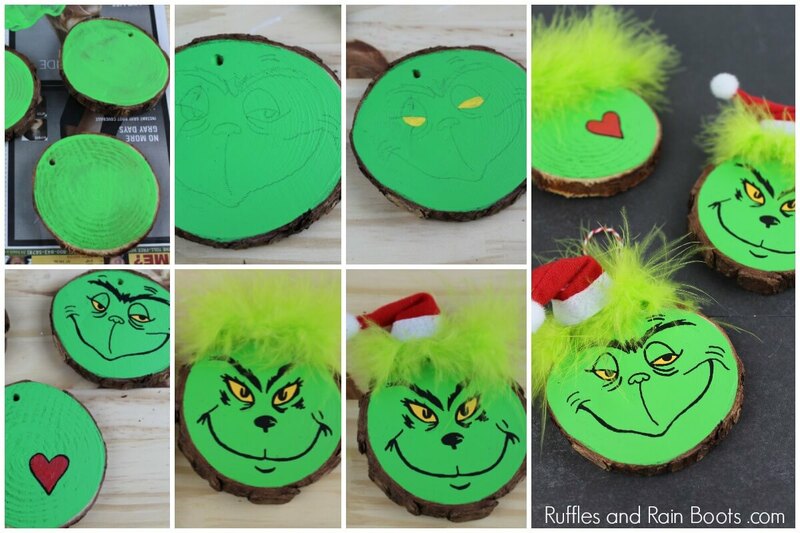 If you have a playlist on YouTube to which you’d like to add this project, here is our Grinch ornament video tutorial. Here at Ruffles and Rain Boots, we are so excited to watch The Grinch each year with our daughter. She’s still at the age where Christmas is full of magic. This year, we are so excited to see the new Grinch movie! I mean, maybe it’s sad to admit but I might be just as excited as my daughter… So, we’re making a fun Grinch Christmas ornament to celebrate the movie and the spirit of the season. 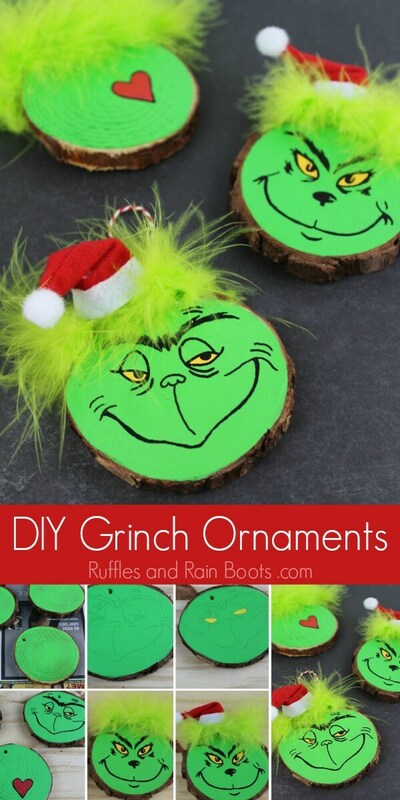 This is a simple Christmas ornament you can make with the kids. Young ones will need help with the ears. 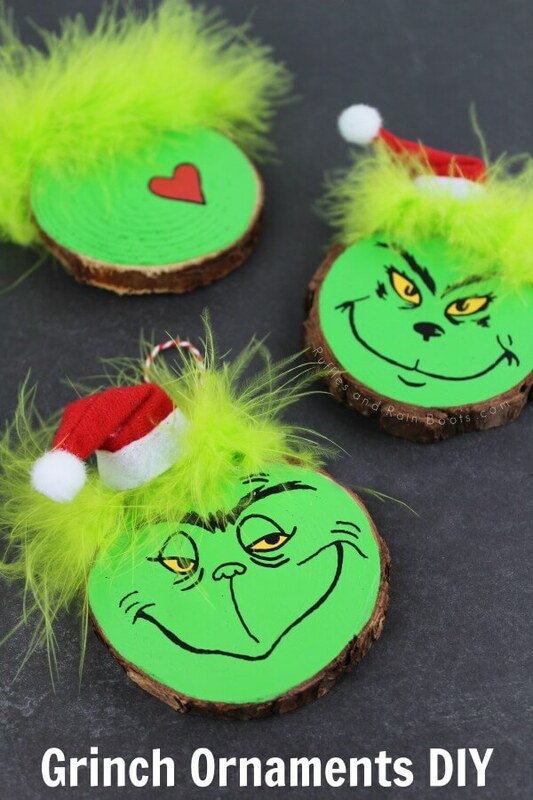 This Grinch ornament set is a fun craft for all ages. Grab a couple of Grinch faces you like from the Internet. 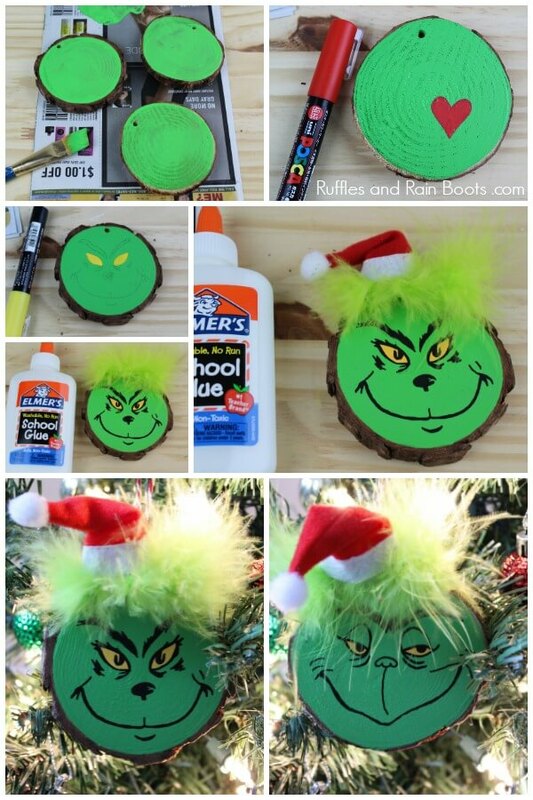 Print them out and trace them or freehand your best Grinch face! Use two or three coats to paint the wood slice green. Let dry completely. Trace a face (we looked at a picture online) onto the wood slice. There are so many great faces online that it shouldn’t be hard to find one you like. Fill in the eyes first with the yellow paint pen. Use the black paint pen to trace over the pencil. For younger kids, let them fill in the outline of heart with red paint pen. Outline in black. 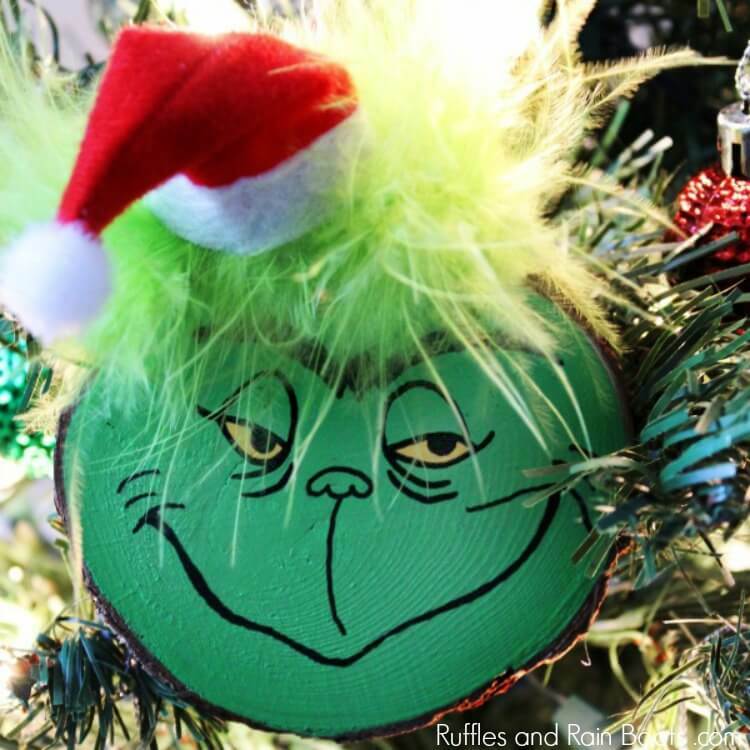 Once dry, seal the adorable ornament with ModPodge to prevent the paint from chipping. Cut a small piece of the boa or grab a few green feathers and glue them onto the top of the wood slice. Glue a mini Santa hat on top of the boa. Glue on a hanging string, if needed. What ornament would you make next with a wood slice? Let us know in the comments or share a picture of one you’ve made with us over on Facebook. Your shares are how we grow and we are sincerely grateful.